“Independent Commissions have been appointed according to the 19th amendment to the Constitution. It too has received a mandate. Hence, we ask officials to carry out their investigations without any fear. The officials need not consider whether the thief is within the government or outside it. You have to carry out your investigations. The JVP will be with you and the masses to take action against frauds and corruption. Do not be scared of statements and set back investigations. The ‘joint opposition’ clique attempts to undermine thefts and frauds. The UNP and the SLFP should be responsible for the political interferences. The President and the Prime Minister from the UNP should reveal to the country that politically interfere in investigations. The officers who conduct investigations risk their lives. They have to confront threats from thieves and fraudsters. They conduct investigations despite their lives have been threatened. 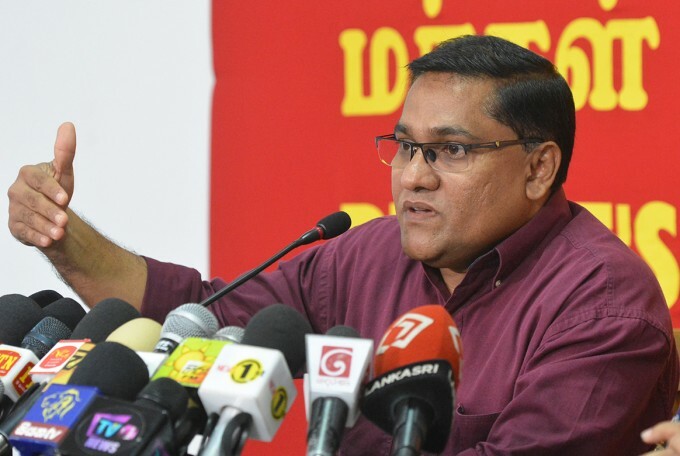 No one should make statements to discourage their self confidence,” says the Information Secretary of the JVP Vijitha Herath. This was said at a press conference held at the head office of the JVP at Pelawatta yesterday (16th). The Member of the Central Committee of the JVP Parliamentarian Dr. Nalinda Jayatissa too was present. Mr. Herath said, “The Rajapaksa regime misappropriated public money and public assets on a large scale. People’s money was used for the personal use of Rajapaksa family. This is being revealed in investigations. The house and land at Malwana, incidents involving CSN channel reveal Rajapaksas’ plunder of public money. Another flagrant fraud that was committed during Rajapaksa regime was Avant Garde incident. We, as the JVP, continuously questioned regarding this. We demanded the government to carry out investigations against it. Several ministers of the present government defended Avant Garde. The opposition for this was so much that the Minister of Law and Order of the government had to resign. Avant Garde is such a flagrant fraud. Investigations against it should be carried out. It is compulsory. Frauds and corruption were a main factor for toppling the previous government. People expected that investigations would be carried out against frauds and corruption. The main factor for the mandate received by this government was opposition to frauds and corruption. The responsibility of fulfilling this expectation of the people is with the President, the Prime Minister, the cabinet of ministers and the government. However, the institutions established for investigations and the independent commissions have not been formed in the manner people expected. Investigations were carried out at a snail’s pace. As such, mass protests surfaced from time to time. We, as the JVP took to the streets. We continue to demand that legal action against fraudsters and criminals should be expedited. Investigations in connection with frauds and corruption being committed by the present government are not carried out. After this government came to power the notorious Central Bank scam was committed on 27th February, 2015. This is the biggest financial irregularity that has been committed after this government came to power. According to profit report of Perpetual Treasuries Ltd., the company involved in the scam has got a profit of Rs. 5.200 million for the year 2015. This profit was obtained after it committed the Central Bank bond scam. Serious allegations have been aimed at the company owned by the son-in-law of the former Governor of Central Bank. Despite initial investigations have been completed; no legal action has been taken. There are no inquiries despite people’s money has been blatantly plundered. People have a justifiable suspicion regarding the affair. Investigations regarding Avant Garde affair has not been completed yet. The Avant Garde fraud continues just like it did during Rajapaksa regime. In 2015 Avant Garde had to pay Rakna Lanka Rs. 843 million. However, the present government decided to write off Rs. 255 million due to Rakna Arakshaka Lanka Limited from Avant Garde. This is an amount the government should get. How could they write off such a sum of money? This shows frauds and corruption continue under this government as well. There were security officers involved in Avant Garde incident. Former Navy Commanders and soldiers were employees of Avant Garde Company. Law should be implemented against them as well. The Law in our country should be equal to all. Today, those accused of financial frauds of Avant Garde Ltd. are using officers of security forces as a shield to save themselves from accusations against them. The ‘joint opposition’ clique to save themselves from being prosecuted shouts that soldiers are being arrested. The President should have taken action against the attempt of Rajapaksa clique to use security personnel as a shield to conceal their thefts. However, what the President did was the opposition of what was expected from him. Also, ministers of the present government too have been accused of various frauds and corruption. People have a just suspicion as no action is being taken against these perpetrators. There are two political parties in this alliance government. Both parties are trying to protect fraudsters. The UNP attempts to protect its associate who is involved in the bond scam. Also, the SLFP attempts to protect corrupt ministers of the previous regime who are in the cabinet of this government. There are allegations against the Minister of Fisheries who leased out Modara Fishing Harbour for a monthly lease of Rs. 125,000 when it was possible to lease it out for Rs.1.7 million a month. However, there are no investigations against him. There are no investigations against ministers who have imported vehicles illegally. There is no investigation against the coal tender that caused the conscience of judges to quiver. These frauds have been proved. Frauds and corruption are committed in this government as well. What should be done is to take legal action against frauds and corruption that had been committed during Rajapaksa regime as well as frauds and corruption of the present government. The law should be meted out equally to all. Now meting out law has become hilarious at times. When the case was heard regarding the land and the mansion at Malwana, Muditha Jayakody and Basil Rajapaksa say they are not the owners and they are free from punishment. The contractor who built the mansion clearly says Basil Rajapaksa paid him for the construction. However, law is not implemented against the thieves. In the CSN affair when it was said there was no owner for the money it was confiscated. It is like when a plantain thief is caught by the police and taken before Court he says he is not a thief but someone hanged the bunch of plantains on his shoulder. Then the Court releases the thief and orders the bunch of plantains to be auctioned. The incidents that were committed during Rajapaksa regime were very serious. They should be investigated without any hesitation. Also, the bond scam, coal fraud and other frauds that were committed during this alliance government too should be investigated. Who is responsible if those in the government themselves come out with wrong interpretations regarding on going investigations? The CID, FCID and the Bribery Commission are under the government. The government cannot shy away from the responsibility of investigations. The President and the Prime Minister must take the responsibility as the leaders of the government. The independent Commissions should be genuinely independent institutions. There is no need to inform their affairs to the President or the Prime Minister. If the President says they act according to a political agenda he should reveal to the country whose political agenda they are following. We would like to know whether investigations against government ministers are not carried out due to such political agendas. It is the government that is responsible for any political agendas followed by these institutions. Statements that discourage officers involved in investigations should not be made. We would like to tell officials of Commissions and officers of police divisions not to be scared but continue with their investigations. They have an authority given to them by the mandate. Independent commissions are responsible for the people. Independent Commissions have been appointed according to the 19th amendment of the Constitution. It too has a mandate. Hence, we ask officials to carry out their investigations without any fear. The officials need not consider whether the thief is within the government or outside it. You have to carry out your investigations. The President and the Prime Minister from the UNP should reveal to the country that politically interfere in investigations. The officers who conduct investigations risk their lives. They have to confront threats from thieves and fraudsters. They conduct investigations despite their lives have been threatened. No one should make statements to discourage their self confidence.